Click on picture to view it full size. Create the 3D meshes for the avatar's body parts in a modeling program. Read the file into AccuTrans 3D. Select a layer for a body part and then click on a button with a picture of the body part on it. AccuTrans 3D changes the layer name and adds the correct RWX tag. After all layers have been identified press a button and the avatar hierarchy is made for you. 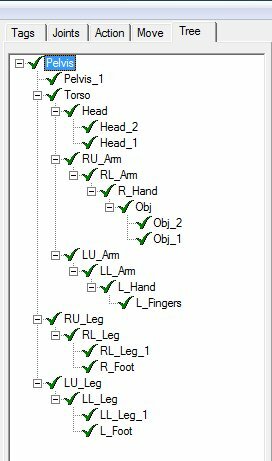 Use the mouse and Windows 'drag and drop' procedures to reposition the nodes in the tree if you do not want the hierarchy for a humanoid avatar. Press a button and the position of all joints, for a humanoid avatar standing erect, is calculated. Select each body part and click on a few buttons to set the joint exactly where you want it. The selected body part is shown in green and the joint position is shown in red. Save the avatar as either RenderWare .RWX or trueSpace .COB files for use with the Active World's browser. Also the avatar can be saved as .3ds file for import into Life Forms (full version and not the LE version) or as a VRML 2.0 .WRL file or as a .MTX file for use in Viewpoint Scene Builder or as a DirectX file. The correct joint names are automatically written to the file for you. Key frame animations for the avatar can also be created using AccuTrans 3D. Read and write the SEQ animation sequence files used by the Active Worlds browser. The correct joint names are automatically written to the file for you. Also the key frame animations can be written with the avatar either to a DirectX file or to a .MTX file for loading into Viewpoint Scene Builder. Avatar and Animation Tutorial is in the help file.